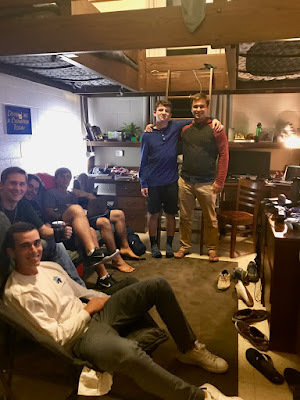 Our Tour de St. Edward- a weekly tour of resident rooms, study lounges and popular hangouts in Notre Dame’s favorite residence hall- continues. Our today’s tour stops by room 221, a freshmen room for Jake Harris of California and Noah Viner of Vermont. Could we have any two residents further a part than these two? Harris: I didn't know much about the hall at the time, but after connecting with some of the guys I knew it was going to be a awesome four years. Viner: I was excited to be placed in a group of fine Gentlemen, but even more excited NOT to have to walk across lake to Carroll. Harris: The lofts are really nice because they create a ton of extra floor space. I get pictures of dorm rooms of some of my friends back home and the rooms in Steds are by far the most spacious. Better yet, having 13ft ceilings means that I can't even touch the ceiling while standing on the loft. With the extra space Noah and I were able to fit a futon on the floor. The room feels less like a dorm and more like a home. Viner: Loft living is lit. The lofts open up a ton of floor space on the ground for some time with the bros. Not to mention I can store my inflatable raft on the upper shelf of the closet. Harris: I think the basketball hoop on the door makes the room. I'm sure other Stedsmen on the second floor have heard the sounds of numerous dunk contests or extreme trick shots off of the loft. Viner: Not only do we have a super comfortable futon, we also brought a couple chairs so any night of the week you'll find a number of other gentlemen hanging out. Harris: That is actually true. Only so that I could transfer back into Steds the following year and go through Steds orientation again. Viner: I told Jake not to tell anyone that. Folks, there you have it... and it sounds like these coasts, east and west, are so far a part after all!